In so many ways, they are just like any ordinary family, albeit a rather large family with twenty-four children under age eighteen, plus mom and dad and assorted extended family members. Younger sisters taunt trouble-makers at school, “I’ll tell my big brother.” They celebrate one another, like when Sammy won good behavior certificates until the school stopped giving them, because it was always him. Or when the entire family celebrated Janet’s and Geoffrey’s acceptance into high school with a giant cake. 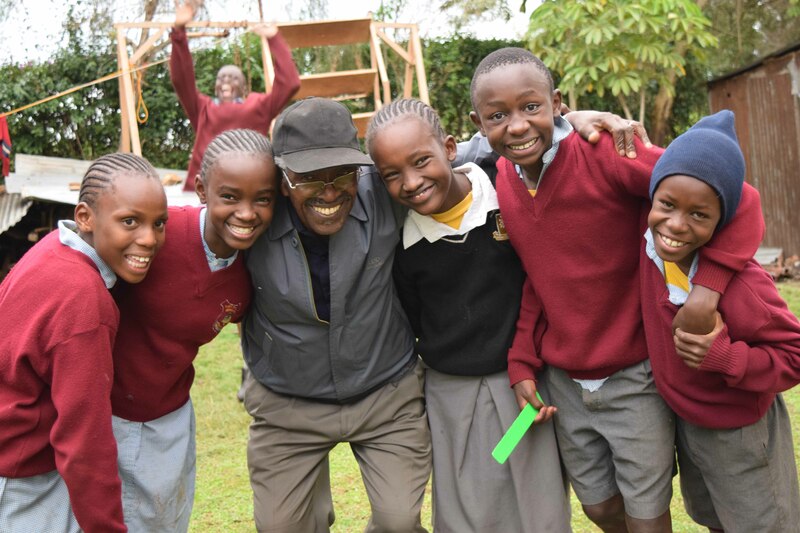 Their parents, Edith and Jepson Karau (Hope’s Promise (HP) Kenya Country Coordinators), teach the Bible faithfully, knowing it is the foundation for their children to balance all other aspects of life; yet like so many other parents, grieve when peer pressure undermines the truth. They are a community knitted together with individual attachments. George, age 14, watches for and eagerly engages older “brother” Steve Kariithi (the Karaus’ son and HP Kenya Associate Director) as soon as he arrives for a visit. Janet, age 15, borrows older “sister” Diana Mutuma’s clothing (the Karaus’ daughter and HP Kenya Administrator). Like any family, they laugh and cry together. And yet, in monumental ways, they are a family unlike any other. Few are biologically related to one another. In fact, in a country where tribal differences catalyzed the loss of over 1000 lives in 2008 post-election violence, they hail from vastly different tribal cultures. Even more challenging, though, traumatic experiences during the first few years of the children’s lives created formidable barriers to healthy holistic development. David, for example, spent his early years locked alone in a slum shack. His single mother wandered the streets, drinking. When she stumbled home in the early hours, he foraged for food wherever he could find it. On the day Pastor and Mama took him home to the Sanctuary of Hope (SoH) family, he asked wide-eyed, “What is moving?” as the car carried him to a life he could never imagine before. When they arrived and children surrounded him, clean, smiling and singing a welcome, he stood shell-shocked. He resisted removing his filthy, ragged clothes. And when they placed a steaming plate of food before him, he scooped it, bare-fisted and furiously, into his mouth before prayers even began. Only later did he learn how to use to a spoon. As caregivers celebrate SoH’s ten year anniversary, their faces unanimously alight at the thought of Esther K.
Somehow, Esther defied the odds and survived. However, at age five, she still could not walk or speak. She rarely, if ever, smiled and her eyes were terribly vacant. Moved by her plight and with the support of HP friends, Pastor and Mama Karau brought her home to SoH in 2010. Not long after her arrival, she took her first steps to the gleeful cheers of her new family. Today, she thrives in a special education school. Just this past June, Esther’s siblings helped her learn to skateboard. It’s tempting to romanticize this extraordinary rescue operation of twenty-four former orphans. And yet as the SoH caregivers describe the highs and lows of ten years of merging into a family, they agree during morning devotions, “The Word of God is with us. And thus far, we are.” In reality, they are simply ordinary people just trying to take one step of faith at a time. And perhaps therein lies the miracle, as each step adds up to the creation of a family deeply invested in one another’s lives. David’s arrival day to his new family, 2006. Left to right, back row: Geoffrey, George, Mama Karau. Front row: Victor, Stacy Jr., David, Pastor Karau, Stacy Sr. ,Janet, John, Kevin. SoH family, 2016, same positions as David’s arrival day. Left to right: Victor, George, Stacy Jr, David, Pastor Karau, Stacy Sr, Mama Karau, Kevin. Missing from photo: Geoffrey and Janet, away at boarding school and John, at an after-school music program. As published in Hope’s Promise’s bi-annual magazine, Reflections, Fall 2016.